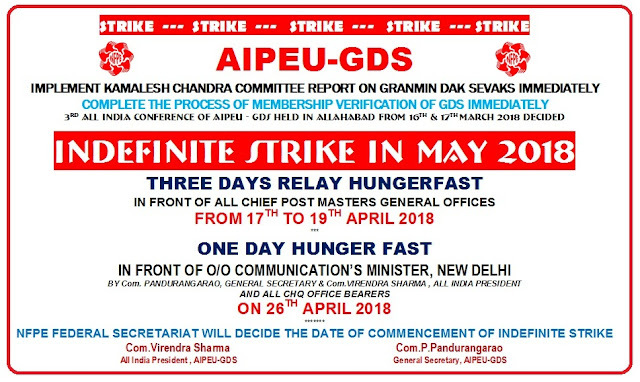 The 3rd All India Conference of AIPEU-GDS held in Allahabad (UP) from 16th to 17th March 2018 unanimously decided to go on indefinite strike during the month of May 2018. 1. Implement all the positive recommendations of Kamalesh Chandra Committee Report immediately. 2. Complete the process of Membership Verification of GDS immediately. Start campaign and preparations for the indefinite strike now itself.